Tom Clancy's The Division has only been out for one day (launch date 8 March), but there are already a whole swarm of strange reports buzzing around about bizarre glitches and bugs that are causing both console and PC players a fair amount of grief. With users on Metacritic and Steam lambasting the game's user review scores and the (admittedly quite brief) server issues at launch, the overall reception of The Division has been mixed among the gaming public at this early stage. Thankfully, among the ire, there have been a few funny glitches and gameplay discoveries during the game's first 24 hours in the wild that have brought a bit of light to the Dark Zone. Annoying troll behaviour, yes. Hilarious that it made it into the final build for release, definitely. A lot of the doors in The Division (as well as... real doors) can only fit one person through at a time. In the game's initial safehouse, being able to pass through said doors is a pretty vital requirement. Some particularly fiendish "trolls" also decided to take things a step further and asked frustrated players for a password before allowing passage, all made possible via the proximity chat feature. For anyone suffering the humiliation of being trapped in this situation, Reddit users are now reporting that running at the perpetrator for a few seconds will allow you to phase through safely. Phew. Taking a page out of the British handbook for politeness, queuing has genuinely become an issue in The Division. It appears that some NPCs operate on a one-at-a-time policy, resulting in some players forming orderly ques while waiting to hand in a completed quest. Whether this is a shockingly ill-judged design choice or a clipping bug for times when multiple users on one server try to speak to a single NPC, the outcome is thoroughly entertaining from an outsider's perspective (but obviously not if you are in the queue). While there are now scenes reminiscent of the London Underground during rush hour, initially players were scurrying about trying to find away round the issue and some still are persisting in trying different angles of approach so they can carry on playing the actual game. Comment from discussion BoomstickBomber's comment from discussion "Just stood in line for 10 minutes to turn in my first quest...". What is it with The Division and doors? One of the easiest trophies to collect in The Division aptly named Shut That Door, tasks players with finding an abandoned vehicle with a door slovenly left open and shutting it by moving into cover and pushing against it. Inevitably, a horde of Door Closing Simulator 2016 jokes are now littering YouTube. Sigh. 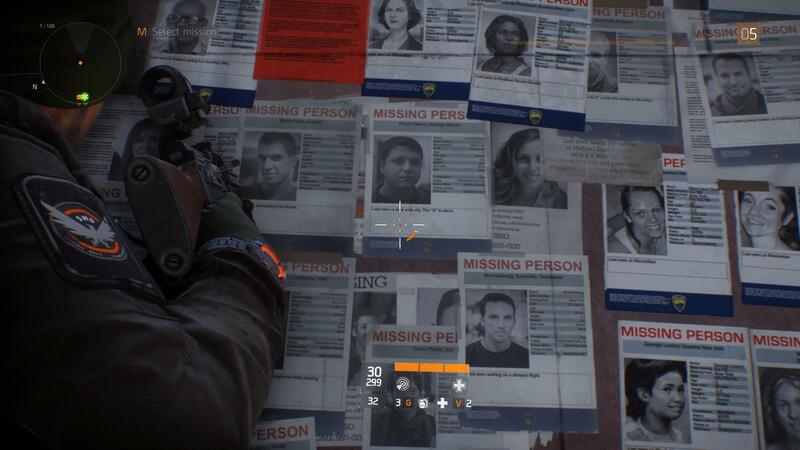 A lot of eagle-eyed Division players have been quite quick to notice a missing persons poster for a certain gentleman named Thom Clancy, but there's a far more inspired reference that has already been unearthed by the community. "Echoes" of pre-virus citizens are commonplace in The Division, but it was the records of a Jonathan Pinkman and a "chemistry teacher" who "operated a car wash" named William White that perked the attention of Breaking Bad fans. Have you spotted anything entertaining or infuriating in The Division after your initial playthrough? Let us know on Twitter.